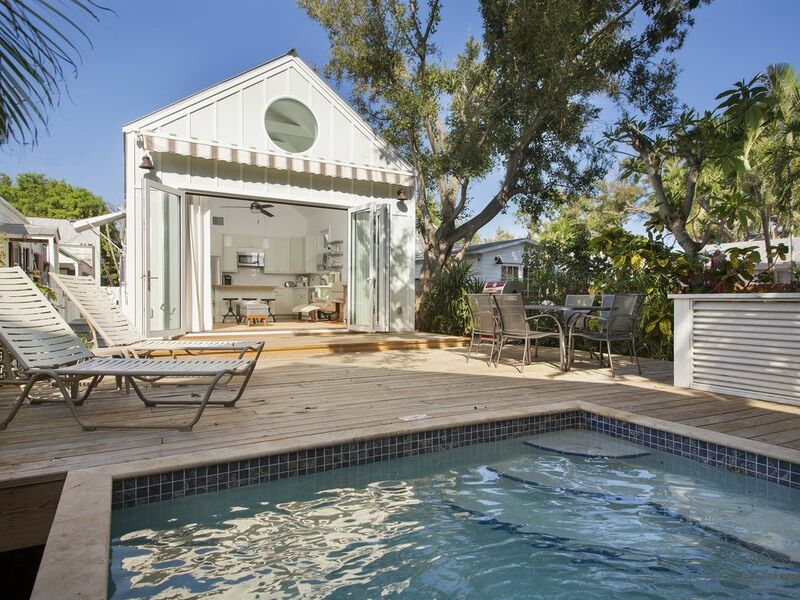 THE EXTERIOR: Lola's Place features everything you might want or need for your monthly vacation in Key West, starting with a private, off-street parking spot (an absolute MUST in Key West) for your vehicle. The front porch lies just off the master bedroom and is the perfect spot to start off your morning with a cup of coffee and a book or newspaper in your hand. The back pool area comes with a pristine, sparkling heated pool (heated October through April) and offers a tranquil waterfall feature making it the perfect tropical oasis. There is plenty of poolside loungers and seating available to soak in some rays as well! THE INTERIOR: The beautifully renovated interior is the perfect combination of Key West decor and modern refinement. The large, accordion glass doors off the living room allow you to enjoy the refreshing tropical breeze and offer plenty of natural lighting. Sink away into the comfy leather sofa while you watch your huge flat screen HDTV. The updated kitchen features white marble counter tops, quiet-close drawers and cabinets, and a large butcher block island top. Enjoy specialty kitchen appliances like a margarita blender and a shot cooler & pourer, perfect for entertaining! Near the front of the house lies the spacious master bedroom with en suite bathroom. The master bedroom includes a brand new, super comfy king-sized bed, and offers a bonus room equipped with a work station, full length mirror, and huge HDTV. The stunning master bathroom offers a double vanity and make up mirror and trendy subway tiling along the shower walls. Just off the master bedroom lies your private front porch, the perfect spot to start off your day with a cup of coffee. The spare bedroom is down the hall from the master, closer to the kitchen and living area. The spare bedroom comes with a brand new queen sized bed, a huge HDTV, two nights stands and convenient bedside lighting. This home is dog-friendly. One (1) dog allowed, up to 25 lbs. Must be 1 year of age or older. Must be spayed/neutered. All vaccinations up-to-date. Please be advised some breeds are not permitted. Lola's Place is a wonderful property. The home is totally updated, cozy and very convenient. If you are a pet owner, you cannot beat the location...a few blocks from the waterfront where there is tons of green space for your pet. We had the best month! February excellent adventure in Key West. This is a wonderful home. Very well located, well kept and updated. Propert management company is great. Handled the few small problems we had very quickly. A great experience all around!